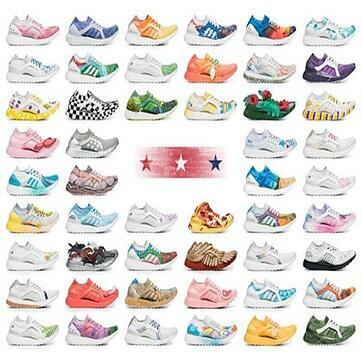 adidas and Refinery29 partnered with celebrated female artists to create one-of-a-kind pairs of UltraBoost X sneakers representing all 50 states. The campaign is the first digital silent auction marketing campaign integrated with adidas' e-commerce platform in collaboration with Wyng, and it's for a good cause! The limited edition BOOST the Nation collection is created for women by women to unite creativity through sport and reflect the nation’s individuality. To set up the first-of-its-kind digital silent auction, adidas reached out to Wyng to help build out a unique digital experience for their customers that highlighted the special sneakers up for auction and the purpose behind the campaign. While adidas may have been the first to launch a digital silent auction, here are a few takeaways that any marketer can incorporate into their next big campaign idea. Pick the right collaborators: adidas partnered with Refinery29 to help them pull together the perfect group of collaborators to design the one-of-a-kind pairs of UltraBoost X sneakers. With Refinery29’s help, they tapped a group of artists including Meagan Morrison, Maria “Too Fly” Castillo, Bree Poort, Lizzie Darden, Jenny Kiker, Sophia Chang, Mari Orr, Jen Mussari, Carrie Chan, Jordana Schrager and Refinery29 fashion editor Alyssa Coscarelli. One could say the partnership between adidas, Refinery29 and their group of artists was a perfect fit! Tap into your resources: adidas reached out to Wyng with a fresh and unique concept. Working with our in-house professional services team, adidas was able to recognize their vision of allowing consumers to not only bid silently on the UltraBoost X sneakers, but also engage with and learn more about the campaign, the artists and the nonprofit organization, Women Win. Creative matters: A great campaign idea can only go so far without amazing creative backing it up. adidas and Refinery29 developed and curated a collection of engaging creative to accompany the silent auction. The pairing of the online auction, donation component, and earnest and captivating creative pushed this campaign to the next level. Sneakers became available on July 4 by auction and 100 percent of the funds raised will be donated to Women Win, an organization that empowers girls to build leadership skills and address gender equity through sport. To learn more about the adidas and Refinery29 BOOSTS the Nation silent auction, check out the below video or read adidas' press release here.